On this April Fools Day, we’ll be discussing hail. Hail is widespread throughout the world, but doesn’t often have the top of mind awareness of other storm-related topics…unless, that is, you’re growing crops or insuring buildings or vehicles. According to the National Weather Service’s hail page, the average loss from hail each year is about a billion dollars. However, in 2001 there was one storm event that eventually stretched from Kansas City to Illinois that caused $2-billion damage on a single day. Hail is not normally considered a major threat to human life. 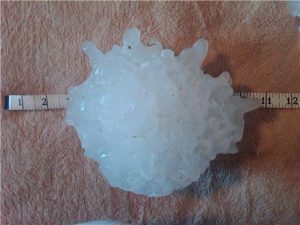 The last reported fatality in the United States was in 2000 when a Texas man died after being struck by a softball sized hail stone. Two children reportedly perished in Russia in 2014. Livestock losses are reported from time to time. The National Weather Service rates hail from less than a quarter inch or pea sized to over 4 inches or softball sized. The preferred references are actual measurements or approximations based on fixed sizes such as a quarter or a regulation sized softball. “Grapefruit sized” is a far less precise term. One of the reasons for using common objects as references is it allows storm spotters and others to report the size without venturing out into a storm with its associated risks to take actual measurements. The largest hail stone reported in the U.S was over 8 inches in diameter with a circumference of over 18 inches. 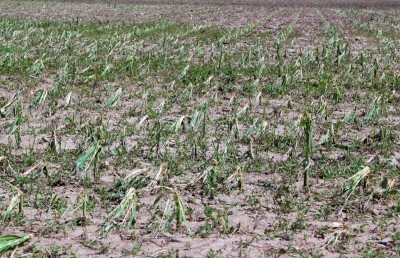 Crop loss from hail is a significant risk to producers. 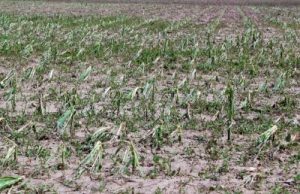 Depending on where crops are in the growth cycle and the extent of the damage, growers are often cautioned to have a little patience to determine if the crops can bounce back. Many state extension services can provide more information. Damage to vehicles is usually pretty obvious in terms of dents and broken glass. There are some DIY fixes for smaller dents including letting the vehicle sit in the hot sun so the metal expands a bit. The best advice though is to contact your insurance carrier and/or a competent body shop. A worst case scenario is when a new car dealer’s lot or other parking lot is hit. Damage can easily escalate into six figures or more. Several years ago here in the Champaign-Urbana area, dozens and dozens of cars parked at the local airport were badly damaged. Hail can also damage roofs constructed of various materials. Again, working with your insurance carrier to arrange for an inspection by a qualified roofer is always a good idea. Some damage may be hard for the untrained eye to see and ladder work is often best left to professionals anyway. Siding on homes also can be easily damaged. Steel or aluminum siding can be dented and still maintain its structural and weatherproof integrity. 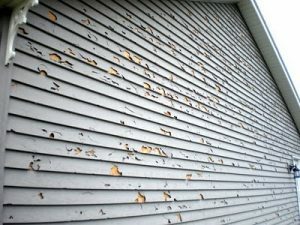 Hail can absolutely shred vinyl siding and immediate action to cover exposed underlayment or insulation is necessary to avoid more widespread water damage. One question that is often asked is, does the presence of hail, especially large hail, tell us anything about the structure of a thunderstorm? Since hail is formed when water droplets freeze as they are lifted above the 32-degree line by updrafts, it stands to reason that the presence of ever larger hail stones in a storm reflects the strength of that updraft so it can be an indicator of both the strength and height of a thunderstorm cell. Hail is easily seen on radar because of its dense mass. Many videos shot by storm chasers show large hail as part of some tornadic thunderstorms.